Sweet and fruity Pimm’s cooks down with honey and ginger to form a deliciously sweet and sticky sauce for this summer recipe. 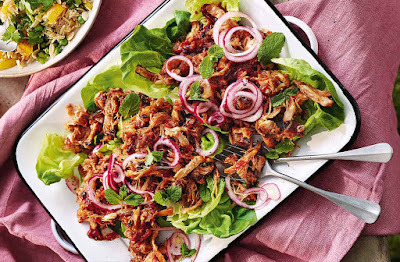 Once tossed through tender, slow-cooked pulled chicken and piled high on a sharing platter, this makes a perfect lunchtime feast. fan 160°C. Heat the oil in a large frying pan over a high heat. Add the chicken thighs and brown, in 2 batches, until both sides are crisp and golden. Transfer to a baking dish large enough to allow the thighs to sit snugly in a single layer. the honey, redcurrant jelly, passata, chopped onion and the ginger; season. Pour the Pimm’s sauce over the thighs and cover tightly with 2 sheets of foil. Bake for 50 mins, then increase the heat to gas 6, 200°C, fan 180°C, remove the foil and bake for another 30 mins or until the chicken is falling apart. Meanwhile, mix the onion rings with the remaining orange juice and vinegar in a bowl. Set aside but stir occasionally. Lift the thighs from the sauce and shred with 2 forks. If the sauce is very watery, pour it into a small saucepan and heat over a high heat to reduce to a thicker consistency. Pour the sticky sauce over the pulled chicken and toss together. Serve hot or cold, piled onto a platter with the lettuce leaves and scattered with the mint leaves and pickled onion rings.